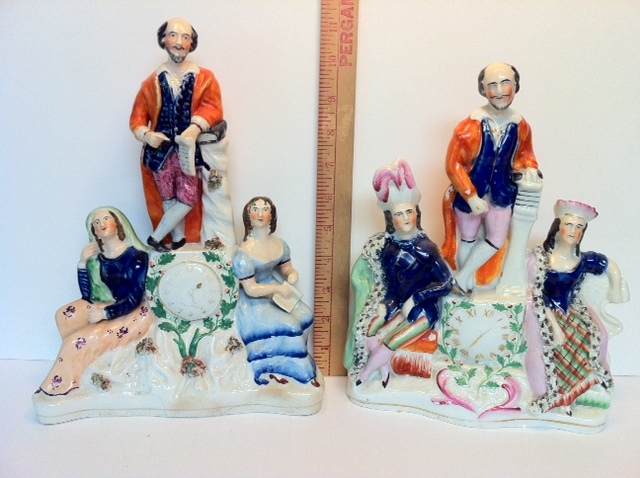 Celebrity figures above, titled, from top left: Miss Nightingale and the Wounded Soldier, a Benjamin Franklin mold from the Parr pottery titled General Washington, Sir Robert Peel, Lady Hester Stanhope and Dr. Meryon seated on camels, The Jewish Landlord from the French opera "Mother Goose", and Captain Cook. If you're searching for a specific titled figure, just ask Elinor! I have hundreds more figures than can be shown on this site. Clock figures related to William Shakespeare. On the right The Bard is flanked by Lady MacBeth and Hamlet. On the left he is flanked by Comedy and Tragedy, which is described in the Hardings' reference as based upon the Mintons' Shakespeare Clock exhibited in London in 1848 and appeared that year in the Illustrated London News. 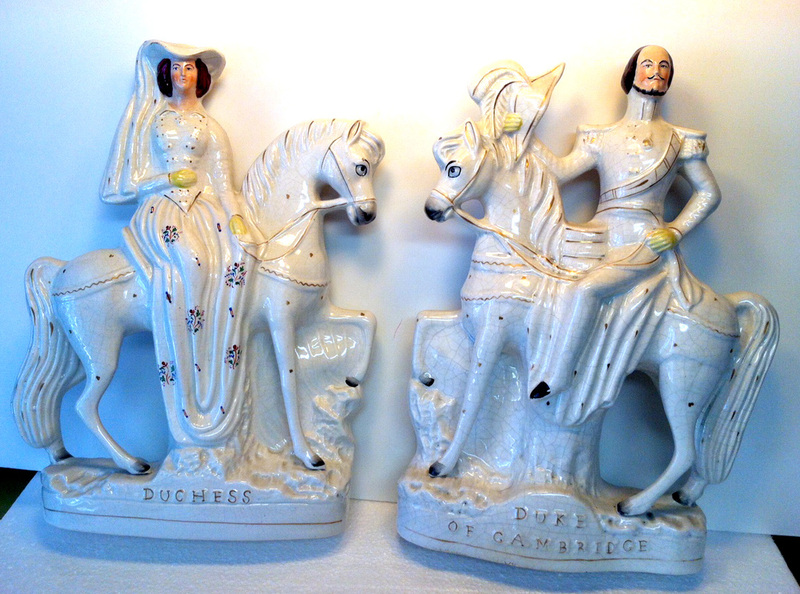 They look great together or separately, $795 each. The right one is 10" tall, the left one is almost 12". This 24 inch Napoleon figure is the largest portrait figure of all, and according to Pugh the most magnificent. There are only four known. The colors are superb. $9500. Napoleon was extremely popular in England where the populace admired his common man roots. Anthony Oliver writes that Napoleon was a bigger money-maker for the potters than Queen Victoria! 14" tall, $895 for the pair. Also available in cobalt blue with salmon horses, $1,600. Kate and Will in cobalt!